We are excited to have you come stay. * I live here and personally greet you upon your arrival and give you the lay out of the rental and information about our community. HA/VRBO Cancellation Policy: 60 days. ~A contract will be sent direct from owner/Manager to you and must be completed and returned along with a copy of a government Photo ID from the payee. ( the reservation name, payee and government ID must match). Our property is listed on multiple VR sites, for consistency, the polices, terms and conditions listed on our rental personal rental agreement document/contract shall prevail and supersedes any and all other polices, terms and conditions described on the listing and booking site that you originally inquired and/or booked this property. The contract is due with in 48 hours of the reservation. Our goal is to see that you are selecting the best choice for your vacation on the beach. Our spacious 2 bedroom serene waterfront beach front bayside rental is located right on the beach, bayside. Our rentals cater to that relaxed experience and type of renters. Families with small children especially love our rentals and bayfront location. You can play all day, and unwind in the evening and have the peacefulness of the bayside for sleeping. We are the owners and offer our charming and spacious 2 bedroom waterfront beach rental which is located right on the peaceful bayside beach sand. This vacation rental is uniquely set in Mission Beach which is located between the mighty Pacific Ocean and quiet scenic Mission Bay. Step out your Bay Front patio door right to the sand. Put on your skates, hop on a bike or leisurely walk for miles on the boardwalk located along the water. You can rent almost any thing you need with in a 5 minute walk. World class surfing, sailing, golfing, and fishing are all easily accessible from your beach rental. The Skimmer is owner managed which allows us to keep it in top condition while being kept welcoming and impeccably clean. Our kitchen is fully stocked for your cooking pleasure. We even include: Dish soap, paper towels, laundry soap, plastic wrap, aluminum wrap, spices, assorted teas just name a few of the extras for your convenience and pleasure. The vacation rental has cable television. All linens and bath towels are provided with 4 pillows on your comfortable King bed and two pillows for each twin bed. Beach towels and beach chairs are provided to ease your load and get you ready for your days in the sand. The Skimmer's living room opens to your own private gated patio and the sandy beach. PARKING: For a MID-SIZED vehicle or smaller. The parking is tight in Mission Beach, please ask about your vehicle before booking with us. If you are interested in The Skimmer, please give us a call or email us for any questions. We like to personally speak with each vacationer, if possible, before confirming any reservations. Personal service is how we have had such a positive experience for our rental career. Keywords: Condominium, beach front, water front, San Diego, vacation home, Mission Beach, ocean, bay, beach, vacation rental, two bedroom. Small personalized friendly service is a our business motto at A Vacation By the Bay. We are individuals who own and manage vacation rentals for ourselves and a few neighborhood properties. With a long time family history in San Diego going back to the turn of the century, combined with roots from the midwest, we have both pride in San Diego, and good old fashioned values. The rentals showcased on this site, reflect, our goal to provide you with quality accommodations, along with personal service from the start of your reservation process, to your final departure. We like to think we attract vacationers who appreciate receiving the exact rental that is advertised on our websites and desire a well maintained vacation home or rental that much care has been taken to provide. In return, appreciate and care for the rentals during their stay. 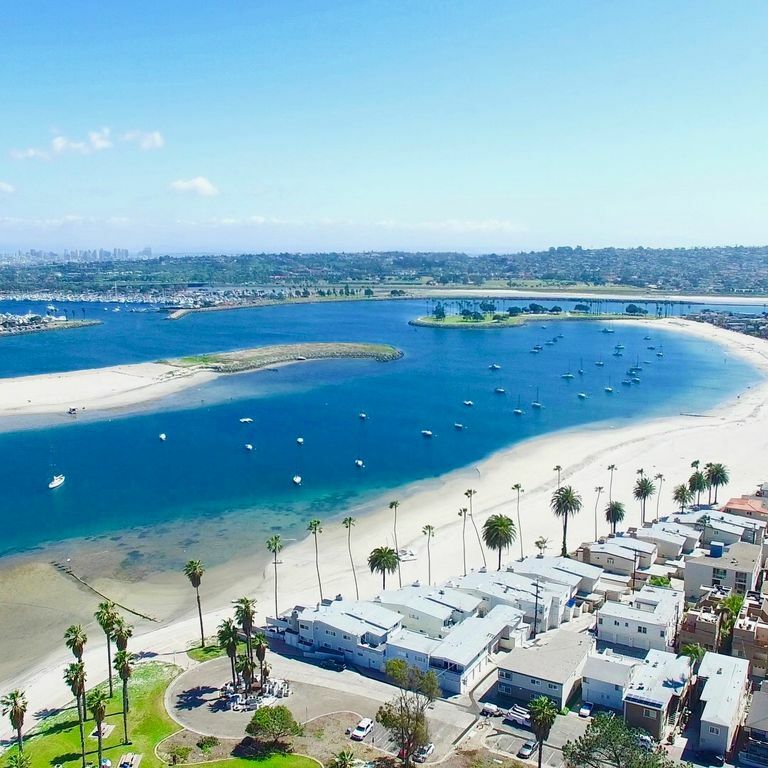 The environment we provide and the bayside in Mission Beach is perfect for low key vacationers, who want an amazing location on the waterfront and coast. The location, the service, the quality of the rental and the personalized service are the main reasons for choosing this property. A Vacation By The Bay has been caring or vacationers for nearly 30 years. We are small and personalized. The Bayside Waterfront has it all, great views, peaceful surroundings and watching the water is a peace of heaven. We own and or manage several properties and create a more low key rental experience. Its suits vacationers who are looking for a lovely rental in a well cared for environment. Our summer season is suited for families who want to enjoy a low key atmosphere. Summer group gatherings which are popular in some rentals, would not be suitable for this property. 1. Caring on site or nearby owner manager to meet any needs that you have while you are staying. With you during the entire booking and reservation process as well. 2. Waterfront so you never have to leave the beach 3. Restaurants and cafes nearby 4. A well managed and cared for, vacation rental 5. Personal Service from the reservation process to greeting you upon your arrival 6. And no unpleasant surprises where by your rental is exactly the clean well maintained home you wanted. The Skimmer has a 3/4 bath and a 1/2 bath in the master bedroom. The location of this vacation rental is wonderful. You are bayfront only need to open you front gate and step out to the beach. Family friendly atmosphere makes it an ideal location. The Skimmer sits on the beach front on the bayside. Your front door is on the waterfront. Please inquire about parking limitations for size and type of vehicle. Parking is very narrow and will only allow for a mid-sized or smaller vehicle. It best to ask. And Coffee Grinder. We also provide a French Press for those who prefer. Fully prepared Kitchen for cooking, all inventory is provided for your cooking pleasure We have everything you would need to cook nice vacation meals for your stay at the beach. Beach toys for the little ones to play in the sand all day long. We are the owners and care about your experience and present you with the exact rental you have chosen. Our location is peaceful, but fun, and you can walk out your front door and do any activity you desire from mellow to robust. Come give us a try, you will be happy you did. All of our rentals are impeccably clean and well maintained for your arrival. We offer personalized service and like to speak to all vacationers before accepting a reservation to see if its the right location for you. We also greet all vacationers upon arrival in order to make for a smooth start to your vacation. Come stay at the mellow bayside beach, but when you are ready for lots of action, you need only walk 150 steps to the ocean front side. Our rentals are also pet and smoke free for people with allergies to those factors. All Reservations are taken in person over the phone. We feel that speaking to each other in person will assure that you have found the best rental for your needs. San Diego beaches and weather are some of the best in the world. Our unit are located right on the sand and waterfront. Mission Beach, in itself, is unique as it is surrounded by water on the both sides. One side is the quiet and serene Mission Bay and 50 yards west is the roaring Pacific Ocean. You can just relax at the beach or participate in numerous water activities. Sightseeing is abundant from visiting La Jolla, the pearl of San Diego, to Sea World, the San Diego Zoo, Mexico, the floating Naval museum - The Midway. The opportunities are endless for everyone with every kind of taste. We are conveniently located to all these activities. Other Activities: San Diego, is a diverse environment from the Sea to the Mountains and in between. What ever you would like to do, San Diego or its surrounding neighborhood areas can provide. Ski: In the winter season, there is Skiing just 3 hours north in the mountains of San Bernadino, just east of LA. Many locals, will take a day trip, for a quick drive, to the slopes.